Belgrade, March 28 (IANS) The Euro 2016 qualifier between Montenegro and Russia was abandoned on Friday due to attack on players and brawl in Podgorica, a media report said on Saturday. Russia's goalkeeper Igor Akinfeev was hit on the head by a flare thrown from the stands just 20 seconds after kickoff, which sent him to hospital and also suspended the match for 30 minutes, Xinhua reported. Dmitry Kombarov became the second Russian player to be hit by an object in the second half and this directly worsened the tense situation on pitch, igniting a mass brawl between the players and staff. The Russian players left the pitch, later followed by the Montenegrin team. A stadium announcement said the match would not resume with a 0-0 score remaining. It was not immediately clear whether Russia would be awarded a victory. Pyrotechnics were used by fans and there were also clashes in the stands. "After the first incident, the (match) delegate told us to continue," Russia coach Fabio Capello said. "After the second incident, there was no way that the match could resume." 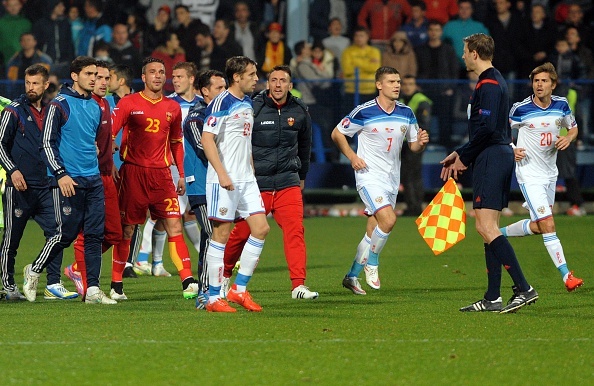 Montenegro coach Branko Brnovic said he expected UEFA sanctions against Montenegro. Akinfeev was taken to the local hospital in the Montenegrin capital Podgorica. Miljan Zindovic, an emergency care doctor at Podgorica hospital, said Akinfeev was brought to the hospital with a neck injury and minor burns. An examination determined he had no major injuries, but the goalkeeper would remain under observation in the hospital for a few hours. Russia and Montenegro are third and fourth respectively in Group G, both with five points from four games before the match.